This one clearly goes in the "politics" category. The sitting judge of the 380th District court has been indicted. Judge Suzanne Wooten, who defeated incumbent Charles Sandoval has been charged with seven counts. This includes Engaging in Organized Criminal Activity (a favorite of the "Special Crimes" division of the District Attorney’s office. The underlying offense and the other counts are for bribery. Bribery, PC 36.02 is a 2nd degree felony, carrying with it a punishment of up to a $10,000 fine and up to 20 years in prison. This investigation of Judge Wooten has been the subject of much debate, and has been called out by many as politically motivated. It also comes at an interesting time, immediately following the investigation by a grand jury of the District Attorney. Judge Wooten, a private practice attorney decided to run for Judge in the 380th District Court. The sitting judge in that court, Charles Sandoval, had been in the spot for quite some time. This was all on the republican ticket, because generally there is no democratic opponent. Apparently quite soon after, the Collin County DA began investigating her. This was confirmed in DA John Roach’s press release. His press release and subsequent statements have asserted that the Attorney General has been handling the case, and not his prosecutors. This, of course, caused Wooten’s attorney to cry foul. Especially when one grand jury’s term was over, and Judge Roach asked to reconvene it. This naturally caused Wooten’s attorney to claim Roach "Lost His Mind." Then (partially simultaneously) a grand jury began investigating Roach and his office. With all of the "high profile" and mostly failed prosecutions, the grand jury began looking at his actions. Former FBI agent Terry Hart was appointed as a special prosecutor pro tem. After this news is when the DA released his press release. 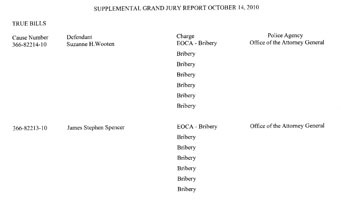 Roach then proceeded to pull all the indictments from the grand jury empaneled by Wooten, to "resubmit them" to another grand jury. Which leads us to today — the indictment of Wooten. Along with three co-defendants, James Spencer, Stacy Cary, and David Cary. I haven’t seen it on the Collin County Website, but it should be there soon.